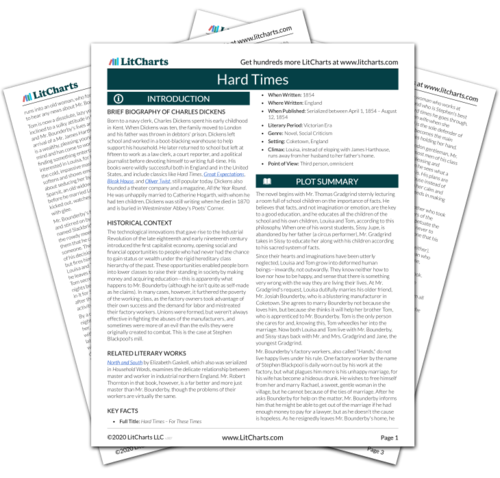 Instant downloads of all 945 LitChart PDFs (including Hard Times). 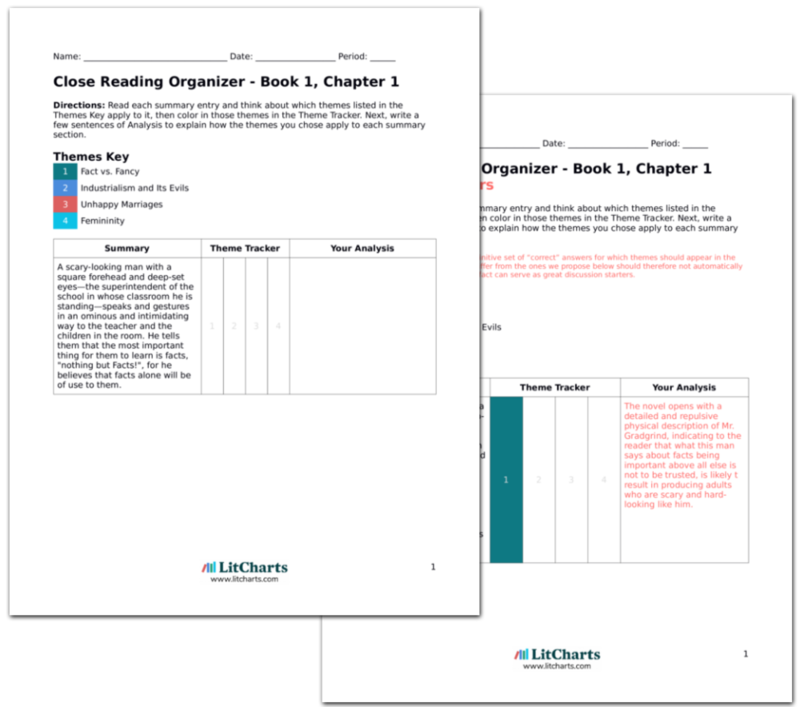 LitCharts assigns a color and icon to each theme in Hard Times, which you can use to track the themes throughout the work. Back at Mr. Bounderby's house, Bounderby is rather nervous as to how Mrs. Sparsit will take the news of his engagement (knowing she has never reacted favorably in the past to hints of it). When he finally breaks it to her, she condescendingly wishes them all her best, and makes it clear that she pities him and sees him as a victim in this marriage. Nothing Mr. Bounderby can pompously say moves her from this position. The determination of these two egoistic characters to preserve their pride and vanity at the expense of the other makes for a comic and ridiculous scene. Mrs. Sparsit's belief that this will be an unhappy marriage, will prove to be correct—and she will do everything she can to make it unhappy. The day of the wedding comes, and Louisa and Mr. Bounderby are married. Tom thinks only of all the advantages he will gain by this marriage, such as how Mr. Bounderby will have to treat him better now. After the wedding breakfast and before departing with her new husband on their honeymoon to Lyons (where Bounderby wants to observe some factories), Louisa is trembling and looks upset. Tom doesn't notice a thing and cheerfully passes her off to Bounderby. Tom's selfishness and total self-absorption is on display here. First he sees the marriage only in terms of what it will do for him, how he can use the marriage as a kind of transaction to make Bounderby give him more respect. And he is so caught up in these thoughts that he does not even notice—or care about—his sister's obvious dismay and deep sadness. Tom's education proves to have turned him into a not very nice young man. Kustner, Gabriella. "Hard Times Book 1, Chapter 16." LitCharts. LitCharts LLC, 17 Nov 2013. Web. 23 Apr 2019. Kustner, Gabriella. "Hard Times Book 1, Chapter 16." LitCharts LLC, November 17, 2013. Retrieved April 23, 2019. https://www.litcharts.com/lit/hard-times/book-1-chapter-16.